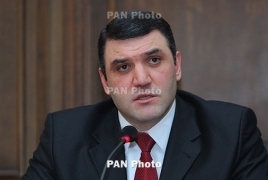 PanARMENIAN.Net - Snap parliamentary elections are not an end in itself and must seek to solve a political problem, lawmaker from the Republican Party of Armenia Gevorg Kostanyan said on Tuesday, May 15. “If the actions of both the opposition and the authorities are directed solely to the welfare of the country, it is my deepest conviction that there is no need for snap elections,” Kostanyan told reporters, according to Aysor.am. According to him, it doesn’t matter which party has the power or who is the Prime Minister. “We all understand that if our government - headed by Nikol Pashinyan or someone else - fails, it lets the entire country down,” Kostanyan said. The member of parliament added, however, that the time will show whether elections are necessary or not. Prime Minister Pashinyan said earlier that snap parliamentary elections may be held in 2018. Pashinyan was elected the Armenian Prime Minister on May 8, following weeks of protests and a campaign of civil disobedience that sought the resignation of the ruling authorities. Former PM Serzh Sargsyan was ousted just one week after taking the post, while the National Assembly was left with virtually no choice but to elect Pashinyan as the country’s next Premier. During rallies, Pashinyan demanded the resignation of ruling authorities, the election as PM of the “popular candidate” - i.e. himself - and snap parliamentary elections.